HomeCinemaMasalaShilpa Shetty and Karan Johar come together and it is not for a film! Do you remember the way Shilpa Shetty grooved in the song ‘Shut Up and Bounce’ from the Karan Johar production Dostana? Well, the actress and the filmmaker have now reunited but not for a film. It is for the radio show Calling Karan which has the director-producer playing agony aunt to lovers and their issues. Shilpa Shetty Kundra came to the show as a guest for the promotions of her new venture. Shilpa Shetty Kundra will be seen in the reality show ‘Hear Me Love Me’ that will feature on Amazon Prime. The web series revolves blind dating and is adapted from the Israeli version, Abot Hameiri. After being a judge in reality TV dance shows including the recent Super Dancer, the actress will making her digital debut as the host of this show wherein she will also help the female contestants in deciding the right partner. The dating show follows a format where the female contestant goes out on a date with three potential guys and at the end of it, has to choose ‘the one’ for her. The age bar for this show ranges from 21 to 32 and the female contestants will have a GoPro attached to them whilst being on this date. Earlier the actress had expressed her excitement to work in this edgy and unusual dating reality show and she believes that this show will put to rest the myth that looks are everything during a date. 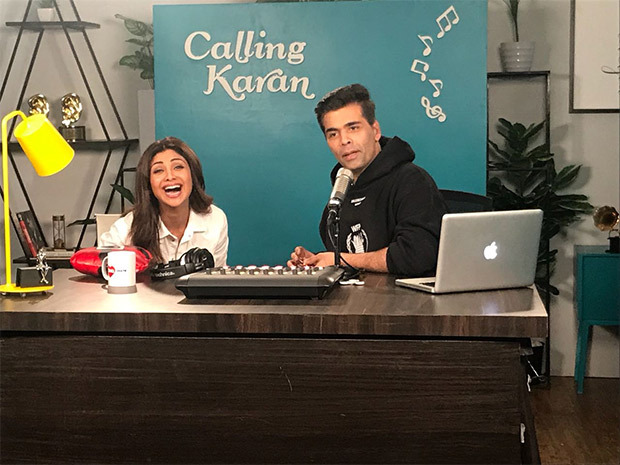 On the other hand, Calling Karan that goes on air on ISHQ 104.8 FM has Karan Johar talking out to all lovers and tackles their problems which include incompatibility, infidelity and many such topics related to relationships.